Order our book ‘Heaven Above’ £11.00 incl postage. Please make cheques payable to Incisive Letterwork. 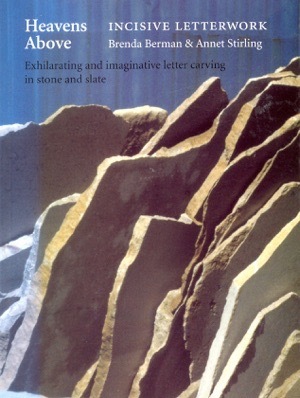 Heavens Above features the recent letter-cutting work of Incisive Letterwork - the inspirational professional partnership of Brenda Berman and Annet Stirling, leading practitioners of the art of letter-carving. Incisive Letterwork has fulfilled commissions for original hand-carved lettering on stone surfaces such as portals and plaques for major public institutions including the Kunsthalle Hamburg and the National Gallery, National Portrait Gallery and Royal Opera House, London. Heavens above accompanied a touring exhibition of their work. In this dramatically illustrated book, designed by Ron Costley, Berman and Stirling reflect on the context, the aesthetic and the practice of their work through detailed descriptions of some of their most important public and personal projects. In the text David Whiting, curator and critic, summarizes the career and achievements of Incisive Letterwork; Charles Saumarez Smith, Secretary and Chief Executive, Royal Academy of Arts, covers their major work at the National Gallery in London; Gerald Cinamon, design historian, and Trev Haysom, Purbeck quarry owner, add specialist contributions.